Unconventional Oilseeds and New Oil Sources: Chemistry and Analysis is presented in three parts, with each section dedicated to different types of oil sources. Part One deals with plants (vegetable, herbs, shrubs), such as Hibiscus, Mexican Poppy, Cucumber, Squashes, Sesame, etc. Part Two presents unconventional oils found in trees (like Balanites aegyptiaca, Annona squamosal and Catunaregam nilotica), and Part Three deals with new oils found in insects, as in the water melon bug and sorghum bug. 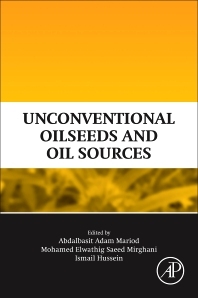 This book will be of interest to researchers in oilseed production, research and development personnel, food scientists, plant breeders, product development personnel, and government agency personnel involved in the production, transportation, distribution, and processing of oilseeds. Morphological study of Balanites aegyptiaca Del. Dr. Abdalbasit Adam Mariod is a Professor in the Department of Biology, College of Sciences and Art, University of Jeddah, ALkamil, Saudi Arabia. He is the founder of Ghibaish College of Science & Technology, Ghibaish, Sudan. Dr. Mariod has authored more than 92 publications, most of them in new oil sources of Sudan. He is an expert in oil chemistry, and has published six books and four book chapters. He received his PhD in Food Chemistry in 2005 from the Faculty of Natural Science and Mathematics, Institute of Food Chemistry, Westfälische Wilhelms-Universitäat, Münster, Germany. With over 15 years of experience and having led workshops on Gum Arabic, Dr. Mariod has put together a team of leading experts from key gum Arabic producing regions, representing the latest research and developments with this important emulsifier. Dr. Elwathig is a biotechnologist specializing in Food Chemistry and Biochemistry. His involvement as a teacher and researcher has also made him an expert in the analysis of halal products. Previously he was working with the National Oilseed Processing and Research Institute (NOPRI) of University of Gezira, Sudan. Now he is a lecturer in the Biotechnology Department, Kulliyyah of Engineering in IIUM and was appointed as Deputy Director (Research and Innovation) at INHART.